The term “vitamin E” refers to a family of eight related, lipid-soluble, antioxidant compounds widely found in plants. The tocopherol and tocotrienol subfamilies are each composed of alpha, beta, gamma, and delta fractions having unique biological effects. Different ratios of these compounds are found in anatomically different parts of a plant. For example, the green parts of a plant contain mostly alpha-tocopherol and the seed germ and bran contain mostly tocotrienols. Along with other nutrients tocopherols and tocotrienols are concentrated in the bran layers of the rye grain, and are only present at low levels in the flour endosperm. Tocopherols are also present in algae, mint teas, and other food stuff. When this family of compounds was first discovered and determined to be essential for health, a standardized test for its activity was devised for which the members of the family were rated for their biological activity. In one test, alpha tocopherol scored highest and was rated 100% with all others having lower ratings. In accordance with this rating, alpha-tocopherol was deemed to be the essential compound and was called vitamin E. One International Unit (IU) of vitamin E activity is the activity under this rating of one mg of the plant-derived form of alpha-tocopherol. Since the original rating method was established, many additional important biological effects of these compounds have been discovered and many nutritional scientists now consider that rating method to be incomplete. For example, by the original rating, gamma-tocopherol was only 10% to 30% as strong as alpha-tocopherol, yet more recent studies have shown it to be essential for maintaining the health of cell membranes, especially if alpha-tocopherol is being supplemented. New studies continue to elucidate the unique benefits of individual members of the vitamin E family. For these and other reasons, the original definition of vitamin E has been enhanced to include all eight family members and the related compounds that convert to them in the body. The primary purpose of supplementing with vitamin E is to suppress damaging free radicals. Scientific studies have identified the gamma-tocopherol form of vitamin E as being critical to human health. Research shows that sesame lignans increase gamma-tocopherol levels in the body while reducing free radical damage. 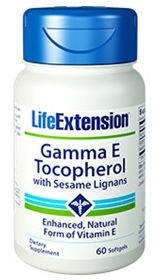 In response to these findings, Life Extension has reformulated the popular Gamma E Tocopherol supplement to replace tocotrienols with sesame lignans. This formula provides more gamma-tocopherol than the previous version, and it is fortified with standardized sesame lignans to augment the antioxidant effects of gamma-tocopherol. Other ingredients: gelatin, glycerin, lecithin, water, beeswax, carob, rosemary extract. Contains soybeans and peanuts. Contains sesame. This product contains NO milk, egg, fish, crustacean shellfish (lobster, crab, shrimp), tree nuts, wheat, yeast, gluten, corn, or rice. Contains NO sugar, and no artificial sweeteners, flavors, colors, or preservatives. Take one softgel once or twice daily with food, or as recommended by a healthcare practitioner. Because Vitamin E inhibits blood clotting, consult your healthcare practitioner if you are taking anticoagulant drugs or have a bleeding disorder.